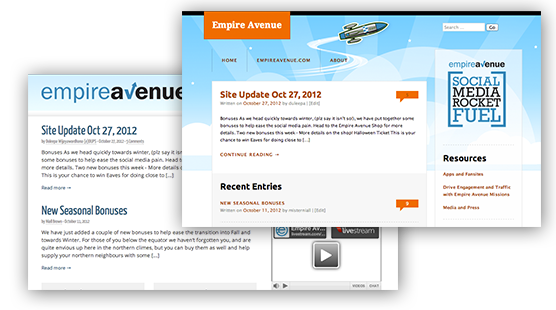 If you are a frequent visitor to the Empire Avenue Blog, you might notice that the blog has had a bit of a facelift to more closely match EmpireAvenue.com itself. It's been on our list of things to do for a while! We've moved over to a hosted service by our friends over at Wordpress.com who do such a fantastic job that we thought supporting their efforts and having our blog hosted there was the right thing to do! We've even taken advantage of one of Automattic's Premium Themes. Don't forget that you can connect your Wordpress.com blog directly through the Wordpress API at Empire Avenue. 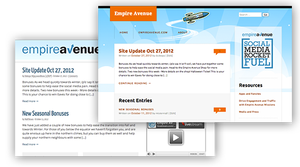 As part of the changes we're also removing Planet.EmpireAvenue.com. We've moved over the relevant content including the "Apps and Fansites" information which is now housed with this Blog. If you have an App or Fansite that you wish listed, please let us know by way of the form we've enabled on the page!